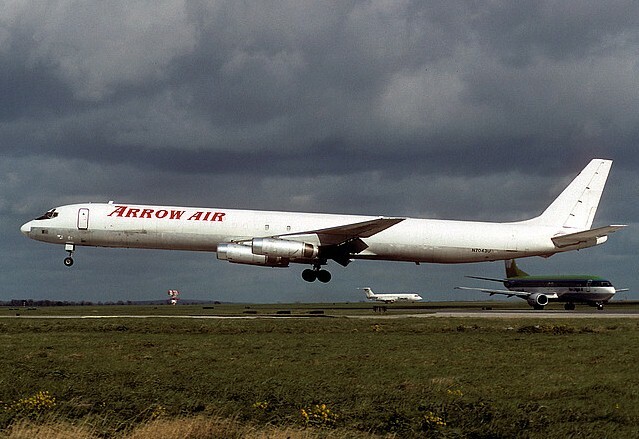 Arrow Airlines was established in 1947 by George Batchelor as an all-cargo operator. Passenger services were adopted in the late 1970s and early 1980s both on a charter and regular scheduled service basis. They adopted the name Arrow Air. Air Arrow was acquired by Fine Air in 1999 but it remained flying under the name Arrow Air. Fine Air also operated under its own name. In January 2004 Arrow Air filed for Chapter 11 bankruptcy protection but continued to operate after a bankruptcy court approved its restructuring.